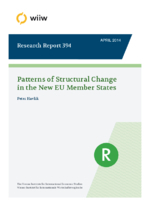 This paper analyses the extent and impact of structural changes on aggregate economic growth that occurred in European economies during the past two decades, focusing on the new EU Member States of Central and Eastern Europe. After presenting some stylised facts related to employment and output restructuring, we use a conventional shift and share analysis in order to evaluate the impact of broader sectoral shifts on GDP growth, focusing on the period 1995-2011. A decomposition of aggregate GDP/GVA growth using the shift and share analysis shows a distinct North-South pattern of growth and restructuring while the previous NMS-OMS divisions are becoming less relevant. In the North, manufacturing and trade have fuelled growth whereas in the South there has been much less structural change. Apart from these differences, our results partly differ from earlier findings of similar analyses for the NMS. Finally, we analyse differentiated impacts of the recent (2008-2011) crisis on structural changes in Europe and find interesting similarities between (groups of) NMS and OMS in terms of both growth patterns and responses to the crisis.